Last school year, a partnership between the Allen County School District and Med Center Health brought an on-site health care clinic to the school district. This year, a new component of the partnership has led to the establishment of a comprehensive strength and conditioning program---a program designed to help better prepare Allen County-Scottsville student-athletes for the rigors of competition and thus perhaps avoid injuries. The new strength and conditioning program has been launched under the guidance of Kevin Winn, the sports outreach coordinator for Med Center Health. As part of the partnership, Winn will lead the program for Patriot and Lady Patriots. For eight years, AC-S has contracted for athletic training services, most recently through Med Center Health. The agreement ensured that a certified athletic trainer was at practices three days a week, and on the sidelines during games if someone was injured or required taping or training services. 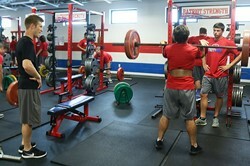 To reach that goal, Winn is introducing a comprehensive strength and conditioning program to the high school athletes. The depth of the program is somewhat new to AC-S and goes in line with a growing trend across the nation. Winn explains that a school contracting with a strength and conditioning coach who specializes in the field frees up the athletic staff to concentrate on the “x’s” and “o’s” of coaching. The partnership with Med Center Health brings to AC-SH a strength and conditioning coach who is a former professional athlete who has a comprehensive background in the field. Winn attended Louisiana Tech University where he was a four-year player on the baseball team. Following college, Winn was drafted by the San Diego Padres organization and played minor baseball. While in college, Winn earned his degree in kinesiology and exercise science. He has also coached baseball. Winn recently started working with the Patriot and Lady Patriot athletes. The coach admits that it has been somewhat of an adjustment for the student athletes. Winn has been spending an hour with each program two to three times a week. The student-athletes are seeing Winn’s passion and drive in each session. Winn adds that he will also have a second focus as he spends time with the athletes in the weight room. It is the hope for Winn that the strength and conditioning program will be in place for years to come---a program that teaches life lessons. To parents of the student-athlete who may desire for their child to get stronger and be tempted to look for additional ways to reach their goals, Winn points out that it’s important to keep in mind the age level of their child. AC-S will still have trainer Andy Vickery on the sidelines to treat injures should they occur. Winn and Vickery will also work together---another benefit of the partnership. In addition, several of AC-S athletes who have sustained injuries are treated by physicians with the Medical Center. Thus, a “team” concept is established which can allow for better communication between the individuals should an injury occur and treatment and rehab become necessary.